Mix the butter and sugar until well-blended. Add the egg, vanilla and almond extract. Blend in remaining ingredients. Chill dough for at least 2 hours. Divide the dough into fourths; it is easier to work with smaller amounts of gluten-free dough. Roll out one portion of dough between 2 layers of powdered sugar dusted wax paper. Cut into desired shapes and place onto cookie sheet, covered in parchment paper. Bake at 375° for 8 minutes. Makes about 4 dozen cookies. Decorate. In a small bowl, mix sugar and milk until smooth. Beat in corn syrup. Add almond extract until icing is smooth and glossy. If it is too thick, add more corn syrup one tsp. at a time. Divide into small bowls and add coloring. Spread onto cookies. Peel and cube sweet potatoes into ½-inch cubes. Toss with olive oil and sprinkle with a little salt. Add spices. Bake in 400-degree oven for 10 minutes. Remove from oven and stir potatoes, drizzle with agave. Put back into oven. Repeat process every 5 minutes until potatoes are soft. 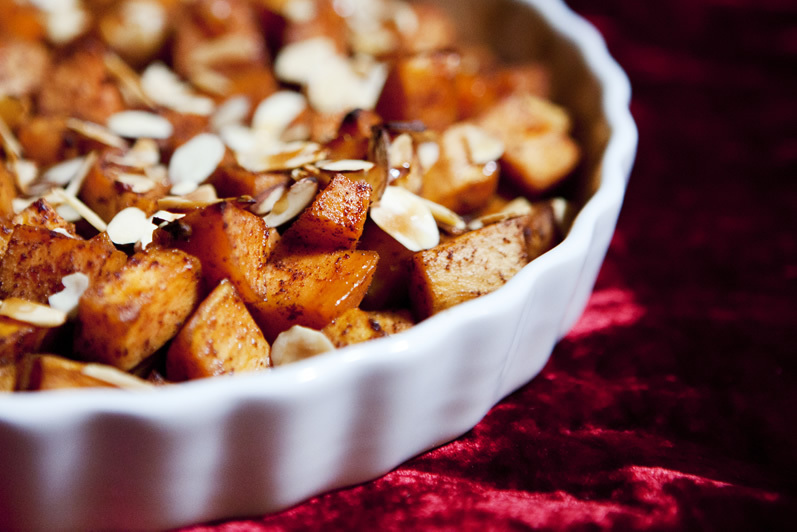 When potatoes are just about soft, sprinkle with toasted, slivered almonds and drizzle a little more agave over the almonds. Bake for another 3-5 minutes. Total bake time 20-30 minutes. cook until the pumpkin is soft. In a pan, heat chicken broth until it is hot, then keep it simmering until it is used. In a heavy saucepan, sauté the onion and garlic in 1 Tbsp. of olive oil and 1 Tbsp. of butter until the onion is soft. Add rice and sauté a couple minutes more. Slowly add one cup of the hot broth, stirring frequently until the liquid is absorbed. Continue to add the hot broth ½ cup at a time until all the broth is used and the mixture is creamy. Stir in the other Tbsp. of butter. Discard the thyme from the pumpkin. 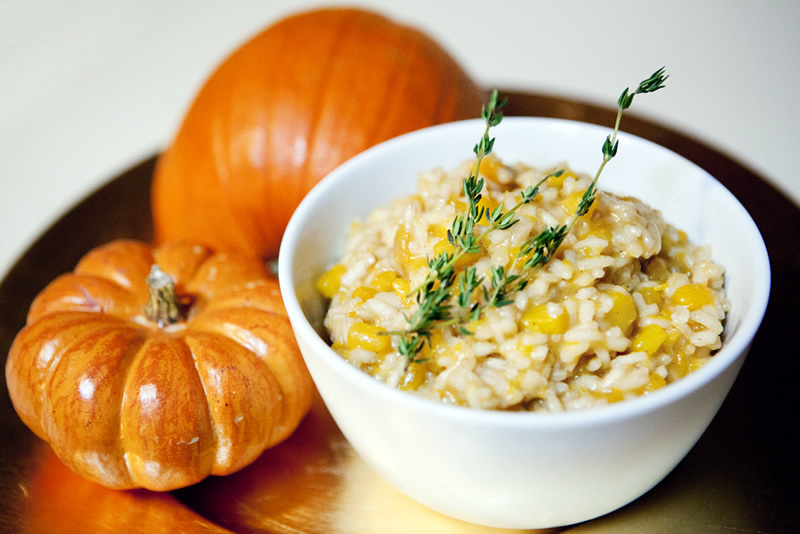 Add pumpkin to the risotto and gently stir. Add more salt and pepper to taste. … and more recipes to come! Check back for how to make stuffed mushrooms. And put ingredients for chocolate turtle cookies in a Mason jar as a great home-made Christmas present!